As the carrying capacity of merchant vessels increased, and the bustling Imperial docks and air-yards became busier and busier, a growing emphasis was to be placed on developing more efficient methods of handling cargo. The Birmingham-based engineering firm run by Doctor Herbert Honeydew was to quickly dominate the growing market for power-assisted stevedoring. The model pictured in this advertisement of the time shows the most common Honeydew model, the Mark 6. Larger, more-powerful models were to see employment in the deep Cavorite mines of Southern Africa as well as in their established role as dockyard workhorses around the world. 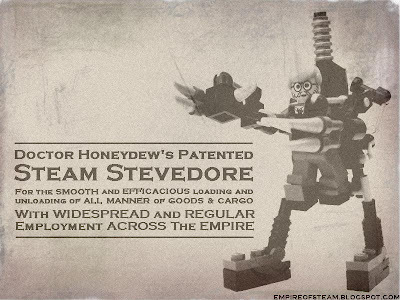 Doctor Honeydew was famous at the time for personal appearances in his company's advertisements, always seen at the controls of the machinery. This was in response to safety concerns raised during the early adoption of power-assistance following a number of unfortunate operator fatalities. The good Doctor was also notable for his pacifist beliefs, refusing to develop military versions of his reliable and popular machines, despite the obvious opportunity for considerable financial gain. Newly-unearthed colour photographs of the Honeydew Mark 6, piloted by the Doctor himself, may be seen here.